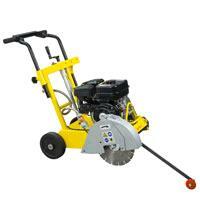 Lightweight 14" gas powered floor concrete saw. Cuts to 4 1/2" deep. 36" long, 19" wide, 33" tall. Large 3.27 qt. fuel tank. * Please call us with any questions about our con floor saw 14 inch push 6 hp rentals in Oak Grove MO, Blue Springs MO, Independence MO, Lexington MO, Odessa MO, Independence MO and Western Missouri.